Earlier this week, I received a bunch of Dannon Activia yogurts by Foodbuzz (seen here) to cook a brunch for a couple of friends. I’ve tried the flavors prior to making anything. I had vanilla, and their fruit flavored yogurts Harvest Picks of peach, strawberry and mixed berry. They tasted good. It’s not too thick or thin and it had a minute amount of tartness from the yogurt cultures. I also liked there were some chunks of fruit, if applicable, blended in there as well. I know this isn’t earth shattering but I can’t help but make a blueberry smoothie with the mentioned mixed berry yogurt and a touch of honey. 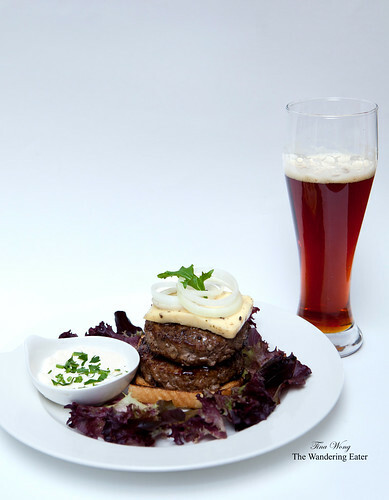 Moving along to heartier food, I cooked up some Pat LaFrieda lamb burgers (cooked to a medium-rare or rare) topped with a semi-soft black olive cheese, onions and a side of parsley-yogurt sauce. (I admit using plain yogurt since vanilla yogurt isn’t going to work here.) Even though the burger doesn’t really need the yogurt sauce, it does give a different flavor aspect. To end this brunch, I made a batch of green tea yogurt panna cotta with passion fruit gelée. I strained Activia’s vanilla yogurt overnight to it would thicken up its viscosity. Technically, you could flavor almost anything you’d like for the panna cotta but I was craving green tea. 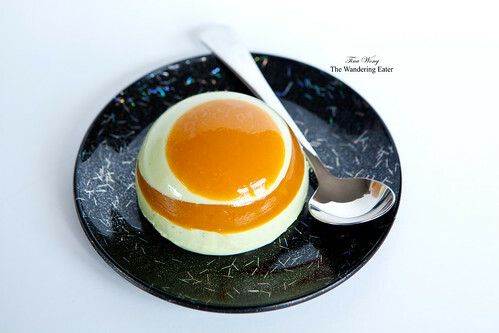 The passion fruit gelée is to give it a bright, sharp flavor contrast to the creamy, sweet, barely bitter, grassy matcha tea. 1. Melt half of butter. Remove from heat and stir in second tablespoon of butter until melted. 2. Whisk egg and yogurt together in the bottom of a medium/large bowl. If you’re using a thin yogurt, no need to add any milk. If you’re using regular yogurt, stir in 2 tablespoons milk. If you’re using a thick/strained or Greek-style yogurt, add 3 to 4 tablespoons milk. Whisk in melted butter, zest and vanilla extract. In a separate, small bowl, combine flours, sugar, baking powder and salt. Stir dry ingredients into wet only until dry ingredients are moistened. A few remaining lumps is fine. 3. Preheat your oven to 200°F and have a baking sheet ready (to keep pancakes warm). 4. Heat your skillet or saute pan to medium. Melt a pat of butter in the bottom and ladle a scant 1/4 cup (about 3 tablespoons) batter at a time, leaving at space between each pancake. 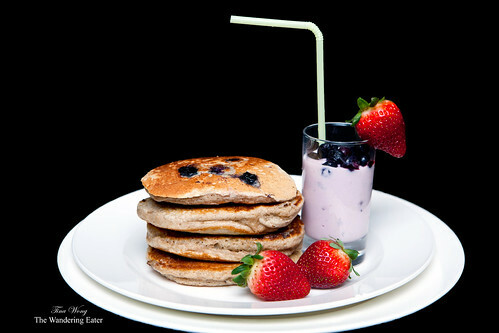 Press a few berries into the top of each pancake. The batter will be on the thick side, so you will want to use your spoon or spatula to gently nudge it flat, or you may find that pressing down on the berries does enough to spread the batter. 5. When the pancakes are dry around the edges and you can see bubbles forming on the top, about 3 to 4 minutes, flip them and cook for another 3 minutes, until golden underneath. If pancakes begin cooking too quickly, lower the heat. Transfer pancakes to warm oven as they are done cooking, where you can leave them there until you’re ready to serve them. 1. Sprinkle gelatin over water in a small saucepan and let stand 1 minute to soften. Cook over low heat, stirring, until gelatin is dissolved, 1 to 2 minutes. Remove from heat and whisk in 1 tablespoon passion fruit purée at a time until gelatin mixture is cool, then whisk in remaining purée. 2. Transfer to a metal bowl and set bowl into a larger bowl half-filled with ice and cold water. Let stand, stirring occasionally, until gelée is consistency of raw egg white, 15 to 25 minutes. 3a. (For tilted layers) Put egg carton in a shallow baking pan and arrange glasses in carton, then tilt glasses to a 45-degree angle. 3b. Divide gelée among glasses, about 3 to 5 tablespoons. It depends upon what the shape and size of your glass and the design you’re going for. Carefully transfer pan with glasses to freezer and chill until gelée is set, about 20 minutes. Save the remainder on the side. 1. In a small bowl, add the matcha and gelatin and mix. Sprinkle the mixture over the water and let it stand for 1 minute to soften. 2. In a large bowl, whisk in half of the heavy cream (it should measure about 3/8 cup) with the yogurt. Heat the other half of the heavy cream in a saucepan with sugar until the sugar is dissolved. Remove from heat. Add the matcha-gelatin mixture into the saucepan and stir while the cream is still hot. Set aside to cool for 3 minutes. 3. Pour in a fine stream the matcha-cream mixture into the yogurt mixture and whisk. 3a. 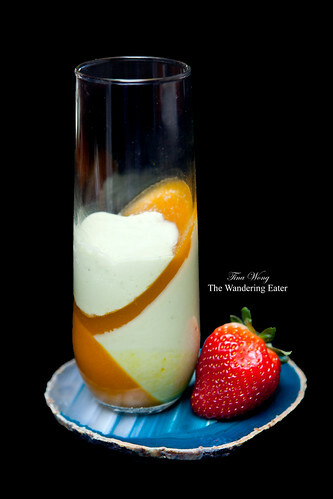 (For tilted layers) Remove the chilled glasses (that has some passion fruit gelée set) from your refrigerator, rotate the glasses so it’s tilting in the opposite direction, and spoon the same amount of yogurt mixture into the glass. Wipe down any streaks or unwanted droplets before it sets. Place it back in the freezer for 20 minutes, until it sets. You may repeat these steps that it would result into a vibrant V-shaped pattern. If you want to level it off, when you pour the panna cotta mixture, keep your glass level so you’ll have the desired flat surface. 3b. Remove the chilled glasses (that has some passion fruit gelée set) and spoon the same amount of panna cotta mixture into the glass. Place it back into the freezer for 20 minutes, until it sets. 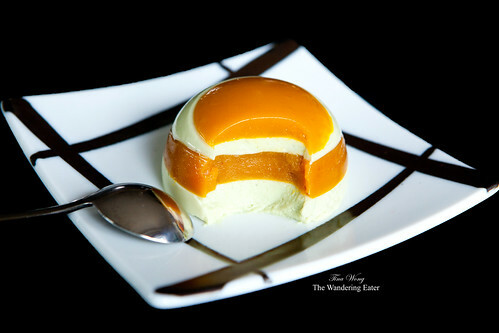 Repeat the layers until both the gelée and panna cotta mixtures are completely used. Chill until set and enjoy. Note: If either mixtures (gelée or panna cotta) solidify at room temperature, heat it gently to make it liquid (make sure it does not boil). Disclosure statement: I have partnered with Dannon to help promote_(product or sample)_. I have been compensated for my time commitment to review Danon Activia. However, my opinions are entirely my own and I have not been paid to publish positive comments. Recipe sound awesome, I’ll try it ! Hey, did you know my blog is called “the wandering girl” ?? We were meant to meet ! I didn’t realize you’re The Wandering Girl. Ha! Small world. The panna cotta is a sure winner…I would love to try this. Amazingly delicious! Thanks, Anna! The panna cotta is really delicious. It disappeared in less than 1 minute when I left it on the table to serve my friends! Beautiful photos. I would love to try making the green tea yogurt panna cotta! Thank you, Vicky! The panna cotta is definitely worth trying to make. I want one of each for dinner. Can I please? As for the panna cotta’s look, I want people to remember how awesome it is. Haha! found your blog through zenspotting…your pictures are absolutely stunning! Matcha and panna cotta are two things I like alot so I am adding the Matcha Green Tea Yogurt Panna Cotta to my “to-make” list. Thanks for sharing!